Presented under the banner of “Journeys to Faraway Lands”, this year’s Istanbul Music Festival puts Turkish composers and musicians into a mix featuring performers and works from around the world. Elsewhere, that might sound like a catch-all theme, yet here it makes complete sense. Taking as its starting point the Années de pèlerinage of Liszt in his bicentennial year, the entire programme flows naturally in a city that has long been at the cultural crossroads. And it’s impossible not to feel Istanbul’s cultural heritage when listening to music here. 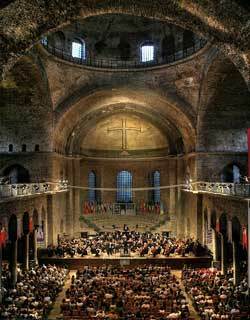 Most of the concerts are given in the ideal acoustics of the fourth-century Byzantine church of Hagia Eirene (the only such church not to have been converted into a mosque, and now a museum) in the outer courtyard of the Topkapi Palace, in the shadow of Hagia Sophia.